A story of a Facebook rant that went viral. In 2016, Rachel Heap was tired, and emotional, and frustrated having come off a rough run at work (as an Intensive Care doctor) looking after people with avoidable problems. 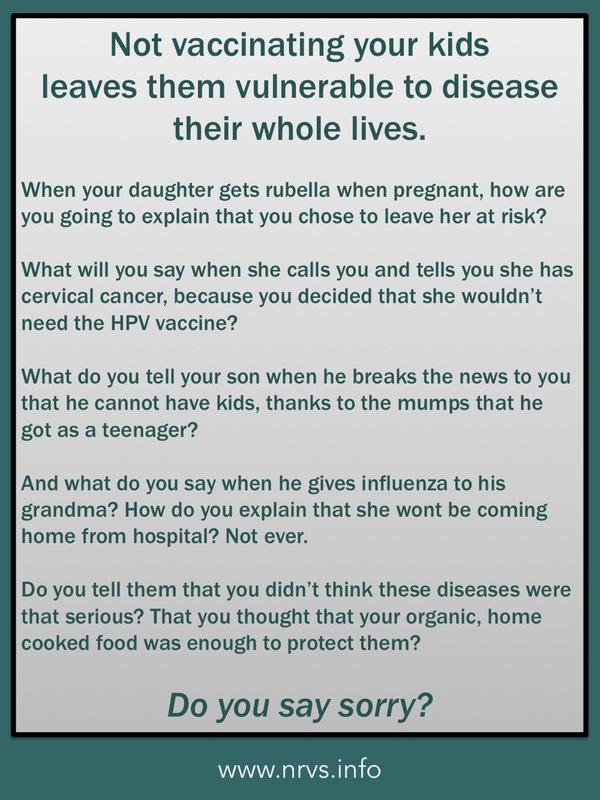 And she listened to the conversations happening about vaccines, and vaccine preventable disease, she realised that the voices of the people impacted by those diseases were not being told. The kids that are left vulnerable to infection had no say, no choice, and their stories needed to be heard. As she knew only too well that diseases contracted in childhood, or later, can cause injuries that impact people their whole lives, she decided that she had to speak up for them. In that context, she made a rant on Facebook, and someone asked her to turn it into a poster. So she did. This is it. Some time after that a medical practice in Colorado printed it out and put it on their wall. Two years later, Sunni Mariah was sitting in the waiting room and she took a photo of that poster, and shared it on Facebook. And then it went viral. At the NRVS we advocate for polite, respectful, and patient conversations about vaccines, and we strive to help families make genuinely informed decisions by helping them understand the real risks and benefits of vaccinations and vaccine preventable disease. We call our approach ‘1000 cups of tea’, because that’s how long it can take to get to the bottom of people’s fears and worries and concerns in the face of the relentless tide of misinformation and lies coming out of the professional anti-vaccination movement. This ‘rant’ was written 2 years ago, and was based on the truth that Rachel lives and see, but was also in the context of being tired and emotional and frustrated. This rant ‘throws shade’, and does not follow the ‘1000 cups of tea’ approach which we advocate for at the NRVS. That doesn’t make it any less true, however. Here are a selection of interviews and reports that have happened since.